In the winter of 1846 – 47, Henry David Thoreau looked out of his small self-built house in Walden and saw a hundred Irishmen with their American bosses cutting ice slabs from the pond. On a good day, he noted, a thousand tonnes were carted away. These ice slabs went not just to New Orleans and Charleston, but also to Madras, Bombay and Calcutta. Thoreau was amused: here he was sitting in America reading the Bhagavad Gita and the water from his well was being taken to the land of the Ganges. In 1831, a Boston businessman named Frederic Tudor, who wanted to make money without physical effort, came up with an idea. He would speculate on coffee prices; coffee consumption in United States was increasing and prices were going up at the rate of 20 to 30 percent. What could go wrong? Within three years, this speculation would put him deep in debt of more than $210,000. He did not know that in 1833 when he met Samuel Austin, a Boston merchant. Austin’s ships regularly went from Boston to Calcutta, but on the trip to Calcutta it did not carry cargo, but empty ballast. Austin wanted to know if Tudor wanted to ship American Ice at a low freight rate. If there was one person in United States who had the expertise to export ice to the opposite side of the globe, it was Tudor. He had invented the ice trade in 1806 by exporting ice, cut from frozen lakes in Massachusetts, to the French colony of Martinique. At that time he had faced ridicule — from his father, relatives, and other Boston merchants — but ignoring them he proceeded. No merchant was willing to carry his cargo, but he overcame that by buying a brig for $4000. Inventing various techniques required for the safe transportation of ice, he delivered ice not just to Martinique, but also to Havana, New Orleans, Charleston and Savannah. He was driven by the belief that once a person in the tropics had tasted cool water, that person would never drink tepid water. And he was right. But he did not make a profit till 1810. He was even arrested and jailed a few times for being in debt. Even two decades later, though he was exporting ice to Southern states, Cuba and West Indies, he was not rich; he made enough to live comfortably. It was then that he decided to diversify and indulge in coffee speculation. But shipping ice to India was an offer he could not refuse. Especially with the low freight cost. Within a week of meeting Austin, Tudor and another business partner William Rogers were thinking of logistics. Tudor himself was involved fixing the Calcutta ship — a vessel with two square-rigged masts named Tuscany — which had the ability to transport 180 tonnes of ice. Ice was cut and transported from the lakes near the Boston harbor. The question was how much of that ice would survive the trip past the two tropics and the equator. There was no fool-proof way of preventing ice from melting; it could just be slowed. Over two decades Tudor had perfected techniques for insulating ice in ships and building safe ice houses. Previously ice used to be cut in a haphazard manner, but now it was cut in uniform rectangular blocks which helped in efficient storage and shipping. On May 12, 1833, under the captaincy of Littlefield, the Tuscany set sail for Calcutta. Tudor did not go on the ship, but instead had William Rogers as his agent. During this long journey, the crew took bath using sea water, ate dinner of pea soup, goose and cranberry sauce and plum pudding. For meat they carried pigs, goat, geese and chickens which were slaughtered as needed. This was supplemented with shark caught from the sea. When a ship passed by, they sent messages to family members. Finally the Tuscany reached the Gangetic delta in September 1833 to great reception. There was a reason for this enthusiasm: they were finally getting rid of the Hooghly slush which was the ice equivalent. To make Hooghly slush, boiled water was poured in earthenware and placed in shallow pits filled with straw. The cool air froze the surface creating a thin film of ice. These pots were then collected and stored in pits for sale during summer. This Hooghly slush was expensive and it was slush. The slush was available for six weeks at a rate of 4 pence per pound and now pure Boston ice was available all year around for three pence a pound. The newspaper India Gazette, argued that ice should be declared duty free. It also argued that the permission should be given to unload the cargo at night. The article had effect; the Board of Customs, Salt and Opium made ice duty free and allowed it to be unloaded during the cool night. 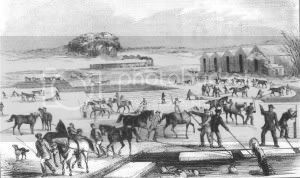 The land for the ice house was donated by the Governor General and people took out a subscription to build an ice house.William Bentinck, the man who got promoted to Governor General of India due to the bad job he did during the Vellore rebellion presented William Rogers with a silver cup acknowledging the enterprise; Kipling wove American Ice into one of his stories in the Second Jungle Book. By 1834, Tudor realized that he had a debt of $210,000 due to the coffee speculation and the ice trade to India had to work. He reached an agreement with creditors which would allow him to be a free man and return to ice trade. After falling out with his partners — Austin and Rogers — Tudor sent another ship with 150 tons of ice, 359 barrels of apples, a new agent and a letter to William Bentinck asking for a monopoly in the Calcutta trade. The ship reached Calcutta after 163 days with just two tons of ice and 359 barrels of rotten apples. It seemed as if the end was near, but what saved him was the letter to Bentinck and the enthusiasm of the British community in Calcutta. The interest shown by the British community can be seen in the communication between the President of the American Ice Committee of Calcutta and Frederic Tudor. The rotten fruit was mentioned and the Committee suggested that he avoid shipping them. Tudor did not agree; he replied that small quantities could be shipped if the fruit was maintained between 32 and 40 degrees. He wanted to ship Spanish grapes and pears as well. The Committee then expressed interest in expanding the ice house so that there would be year long supply. A town hall meeting was convened for discussing techniques for building an effective ice house.Some suggested that the cistern be made of iron, instead of wood. Another wanted a bigger wooden cistern with wooden wall around in which air would be trapped while someone else suggested a brick wall instead of a wooden wall. The committee finally ended by adopting the resolution that the ice house had to be expanded and the public would pay for the expense. Ice was not just used for cooling water, but also as a palliative for those with fevers and stomach disorders. Occasionally there were ice famines — when the ships were delayed or ships went to California due to the Gold rush. During those times the quantity each person could buy was reduced and if he needed more, he had to get a doctor’s certificate. In 1850 when Bombay had no ice, the Telegraph and Courier suggested that there should be an agitation. By 1860, ice was no longer considered a luxury and chilled alcoholic beverages was common. The favorable transport conditions and British support rewarded Tudor’s entrepreneurship. Over a period of 20 years, Tudor made a profit of $220,000 just from Calcutta and paid off his debt. Finally when he got out of debt in 1849, he acknowledged the help of the British community of Calcutta, Madras and Bombay and their help in building a “fine fireproof building unconditionally”, though he was helped by trade to the Southern states as well. He sold ice to both Bombay and Madras, but he had a monopoly in Calcutta. The peak years for the ‘crystal blocks of Yankee coldness’ were between 1840 and 1870. During the American civil war, the Tudor Ice Company could not ship to the southern ports, but there was a growth in trade to India. Tudor died a millionaire in 1864 due to the real estate he owned in the major shipping ports. For example, he owned land in Howrah across the Hooghly river. Business continued even after Tudor’s death; between 1864 and 1866, the company made a profit of $377,000. In 1878, The Bengal Ice Company, the first artificial ice maker in India, was formed and the decline of the American Ice business started. There were other factors too like less severe winters and the commercial decline of Boston harbor. The artificial ice sold for a price much less than the American ice and by 1882 the business came to an end. The ice houses at Calcutta and Bombay no longer exist but the one in Madras, built in 1841, still does as a testimony to a forgotten trade. Thanks to Maddy for sending Reference 2. His post on this topic is a must read. Gavin Weightman, The Frozen Water Trade: A True Story (Hyperion, 2004). D. G Dickason, The Nineteenth-Century Indo-American Ice Trade: An Hyperborean Epic, Modern Asian Studies 25, no. 1 (1991): 53 – 89. So the trade between India-US in 1833 was mostly one way, meaning India was producer nation and US a consumer nation – just like trade between China and US is now! We know, in late 1700s, when British first arrived, India was global economic leader (along with China). And by the time British left in mid-1900s, some 150 years later, India was poor and miserable. So much for imperial English contribution to improve poor Indian lives.